With four debates down and four to go, the answers so far are pretty discouraging. I’ve broken down the four hourlong debates held so far according to the issues that moderators and panelists asked about and how long the candidates spent discussing them (excluding their opening and closing statements). The results show a political discourse that is highly attuned to the priorities of a few powerful business lobbies, but severely out of step with the interests and welfare of the people of Colorado. 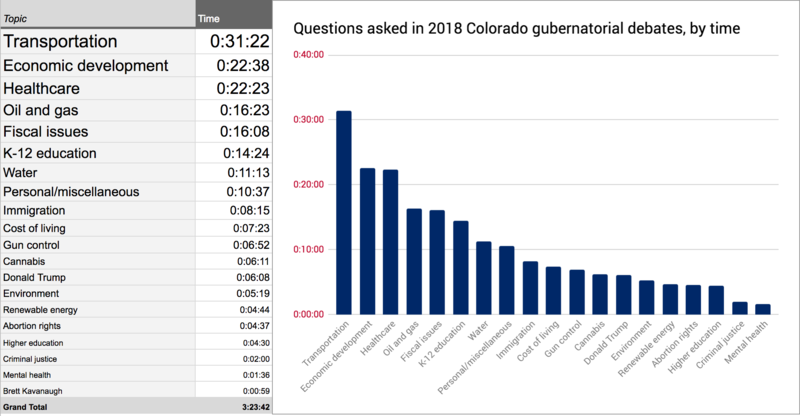 By far the most-discussed debate topic so far has been transportation, particularly in regard to a pair of ballot measures, Propositions 109 and 110, sponsored by the right-wing Independence Institute and the Denver Metro Chamber of Commerce, respectively. There’s no doubt that Colorado’s infrastructure, like that of nearly every other state in the country, is in rough shape and road congestion in and beyond the booming Denver metro area is a headache for many people, but the notion that it’s the top issue facing the state — twice as worthy of discussion as K-12 education, four times more important than the cost of living — is absurd. The disproportionate attention paid to transportation issues in these gubernatorial debates is a clear indication of the influence that wealthy private business interests — like the long list of development and construction groups bankrolling Prop 110 — exert over the boundaries and contours of mainstream political debate. Perhaps an even better indication is the second most-discussed topic on the list: economic development, the governmental term of art for the various tax credits, subsidies, and other state incentives doled out to private businesses in the name of fostering growth and job creation. Polis and Stapleton have spent far more time answering questions like “Do you see the need for changes in the way we attract and retain companies?” and “What new and specific steps would you take to increase incentives for companies to relocate to rural Colorado?” than questions about the stagnant wages, diminishing public services and rising costs of living being felt by working Coloradans all across the state. Again, the journalists running the debates seem more sensitive to the concerns of the C-suite crowd and its trickle-down ideology than to any genuine notion of the public interest. Of course, just as notable as what moderators have asked at these debates are the issues that they haven’t raised at all. Polis and Stapleton are running for the governorship of one of the largest fossil-fuel-producing states in the nation, a state that is already suffering the effects of warming-induced aridification that threatens its water supply and increases the risk of devastating wildfires; neither candidate has faced a single question about climate change in four hours of debate. The opioids crisis now kills more Americans every year than either guns or breast cancer, more than were killed at the height of the AIDS epidemic, and the state of Colorado is now suing one of the country’s largest opioid manufacturers for its role in the crisis; no questions about that, either. Roughly 180,000 Colorado children live in poverty, and one in six Colorado families with children report experiencing food insecurity; no questions about that. No questions about labor issues, homelessness, the rising tide of white supremacy or Stapleton’s public embrace of avowed white nationalist Tom Tancredo. Gov. Hickenlooper recently signed an executive order that would lead to California-style vehicle emissions standards. A group of Pueblo-area auto dealers, along with the Colorado Automobile Dealers Association, say the move amounts to unneeded over-regulation that will drive up the cost of vehicles. Do you support the governor’s executive order? The current federal government has cut down on the number temporary visas for agricultural and service workers, known as H-2A and H-2B visas. How can you as governor help Colorado’s agricultural and tourism businesses get the legal seasonal workers they need to do the jobs that few Americans want? If it passes, it would go into effect as soon as Gov. Hickenlooper certifies the election; he has just thirty days. The governor could call a special session and ask the legislature to delay enforcement. Would you support that? This is insane! Proposition 112 made the ballot despite extreme industry-funded ratfucking efforts that included paying off signature-gathering firms and hiring goons to harass and intimidate canvassers; it’s reportedly polling at near 60 percent despite over $30 million spent by oil & gas companies to defeat it, on top of at least another $80 million spent on astroturfing campaigns in Colorado over the last several years. Public opinion on Prop 112 and oil & gas issues generally could not be clearer — and yet the question being posed to Polis and Stapleton is You’ll help the industry immediately subvert the democratic process and overturn the will of the voters if this passes, right? Again, all of this matters not necessarily because this race hangs in the balance or because any one debate question is going to lead to a sudden epiphany on an issue, but because it’s a high-profile illustration of how Colorado’s political press views the most important issues facing the state and its own role in addressing them. Who are journalists listening to, as they prepare for these debates? Who are they speaking for, when they’re up on stage questioning the people who hope to become Colorado’s next governor? The answer, unfortunately, seems to be the wealthy and powerful, and their astroturf groups and lobbyists, rather than the average Coloradan, or even the average Colorado voter. There are a lot of reasons why this might be the case, but with four debates remaining, one reason worth considering is simply that the journalists asking the questions at these debates are not at all reflective of the community they’re supposed to be representing. Eight of the nine moderators and panelists participating in the debates so far — accounting for 62 of the 70 questions Polis and Stapleton have been asked — have been white men. Nonwhite Coloradans, who make up over a quarter of the state’s population, haven’t been represented at all. There’s been no audience participation or direct public input of any kind. And it shows.